I have continued my hunt for fabulous apps to use in the classroom and came across another goldmine - the TCEA Recommended iPad Apps! I may be late to this one.....as I was viewing this spreadsheet there was 35 other people on it at the same time. Apparently, this one is a bit more well known. After visiting the Twitter Account that this particular app spreadsheet had listed, I found out that this HUGE collection of apps (which is being constantly updated) was put together by Texas Computer Education Association aka TCEA. And while I thought I had spent a lot of time on the other App resource I posted last week, it dulls in comparison to how much time I'm spending on this one. They have neatly organized by subject - you think of it, they have it listed. Handwriting, Literature, Creating, Counting, Dividing, Earth Science, Weather, Health & Fitness, Technology.....the list goes on and on and ON. Seriously - check this one out. Also, at the bottom of the spreadsheet they have a tab for Personal Use list of apps which was pretty cool too! Are there anymore app lists that you have found that would be great for me to check out? Post them below! If you are like any teacher, you collect supplies. Markers, paperclips, erasers, push-pins.....Vista Print items. You name it, we love it. But what do you do with all those items once you have acquired them? Enter my all time favorite organizer!! 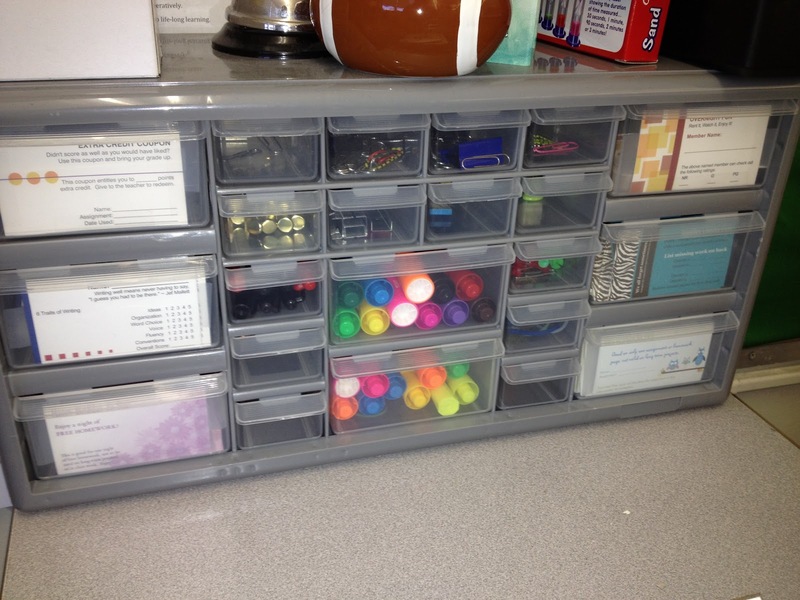 I bought this nifty little organizer one day while walking with my husband through Home Depot. I had seen it before at the Container Store for triple the cost and even though I loved it, I couldn't reason out paying that much for it. So when I saw it for $20, I simply couldn't pass it up. Why do I love this? Well, I'm a bit obsessed with organization and Vista Print (don't know what VP is???? - Click here) and needed a place to put all my cards. This one was perfect because it had enough drawers to fit all the cards I created (I now need a larger one, which this one from Amazon is PERFECT and will soon be mine!). Anyway, I took one card and taped it to the front of the drawer so I could clearly see what was in it and put the rest behind it. The other drawers were perfect for all those little odds and end supplies I need to keep readily at my desk. The best part about these organizers is that they come with the screws to hang them on the wall. Initially I did have it hanging on the wall and LOVED it as it cleared off much needed desk space. However, I have since then moved my desk and had no wall space to put it on where I currently am at. Regardless, I rate this product a 5! 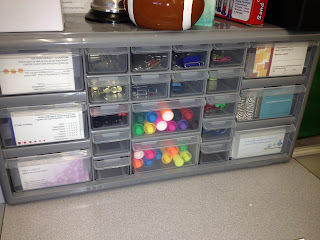 Love it for the possibilities it provides....you could use it for math manipulatives or other centers. Or just use it to organized your Vista Print obsession. What are some ways you organize all your stuff? Share below or better yet....give a link to a picture! For the past couple of weeks, my principal and I have been discussing the possibility of implementing a 1:1 iPad program at our school next year. We were able to visit another school within our deanery that started this program in grades K-8. While there, we were able to walk around and see how they were using these devices within the classroom and speak with the Apple representative to ask any questions we might have. Prior to this, I visited another school the year before that had implemented 1:1 Macbooks at their school. After being able to see both of these machines in action in the classroom, I must say that I am sold on the iPad! At first, I must admit I thought laptops were the way to go, however, now that you can downloads apps such as Pages and Keynote to the iPad, as well as access Google Docs you no longer need the bulky laptop. And the thought of having a device that eventually all the students textbooks are available on, that would eliminate the need for the ridiculous over sized suitcases backpacks the kids have. Of course there are somethings that the iPad can't do right now that I will need to still use our laptops for in the classroom (such as the video creation unit my class does), I know that for the day to day stuff the iPad will work. So, after visiting this school and finding out about some of the apps they were using, I was excited to start researching for other apps (paid or free) that could be used within the classroom setting. I started with my own class and set-up a document that they could submit apps they were using. They had to give me some brief info on the app and explain why I should check it out. (You can see the form here) It was interesting to see how many of my students were using apps they helped them with their studying such as Flashcard+ or calendar apps to keep them organized. And of course, there is a plethora of games that they told be about too! But even after checking out some of the games, I see the educational value in them as well. To check out the apps my students have submitted to me so far - click here. As my students were busy trying to find and submit new and interesting apps to me, I continue my research as well. Which is when I hit the mother load!! I had heard about a school district that was heavily into using mobile learning devices and started to snoop around their district page when I came across THIS! The Escondido School District has compiled a list of 198 apps (and it continues to grow) and organized them by grades level, price, subject, type, etc. You can even choose certain parameters and it will show you only the apps that fit within whatever components you picked. This was a APPmazing resource I found! Not only is it updated but it also provided me with a list of apps that I could share with some of the younger grade teachers who struggle with ways to implement the one iPad we have in our classrooms already. Hopefully, you'll find this resource useful too! Have you come across any apps that you love? Share them below. A good friend of mine told me about a Poetry Bee her daughter participated in with a homeschool group. Her daughter enjoyed reading poems and sharing her own. As I listened to her passionately share this experience with me, I couldn't help but think what a great event this could be in the classroom. I wasn't too keen on calling it a Poetry Bee, I think a Poetry Snap is much more appealing. There are so many ways you could incorporate a Poetry Snap in the classroom. Common Core Standards begin to introduce poetry as early as first grade. Younger students can do a Poetry Snap by memorizing a poem and sharing it with the group. On a special evening or even during classroom time, set up the classroom to look like a cafe. There should be a microphone to use and ofcourse...refreshments. Invite parents to come in with their child that day, prepared to recite a poem. Encourage Poetry Snap ettiquette which is to snap after the poem is read instead of clap. Older students can write their own poems for their Poetry Snap and share with just classmates or you could invite parents as well. Students can choose the style of poetry they want to write and the teacher could explain to the audience the details of how you write those styles of poetry. My last idea is that you could do this school wide and host a PTA or PTO activity. Free or low cost activities are always popular with families. Classes could write poetry during school hours. Then they come in the evening to share their poem with the school. Snacks could be sold to raise money for the school. If you have a larger coffee house close by your neighborhood, you could team up together and ask them to host the event and share the proceeds of coffee/treats sold that night. I've made a Poetry Snap invitation template that can be changed in Word. Download it here. When you attempt to view it in google docs, it will say "no preview". All you need to do is click on File and then select download. Tell it to save and it opens in Word for you. Enjoy! Adrianne Meldrum is the author of KidsCogWorks.com and the inventor of the Brain Tower Game. She currently tutors struggling readers and middle school math students. Adrianne is the wife of a civil engineer and a mother to three handsome boys. Until I can completely go paperless in my classroom, I find that every week it is very easy to get buried in papers that my students turn in. I'm sure we have all been there - you go and grab the papers from the homework tray and sit there separating them into organized piles as you flip and turn them so they all face the same way (is that a paper with no name? Sigh.) and you do this until all the papers are finally in neat stacks. Before you know it, 20 minutes have gone by and you still haven't even begun grading yet! Been here? Yep - me too! Enter my Market Monday product - paper trays!!!! I know, I know. You already have paper trays. And heck you may have some sort of system. But I can assure you that the system I have in place for my 5th graders is almost foolproof to help knock that 20 minutes you spend sorting and switch it to grading time instead. Here's what I do. I have six paper trays that I stack together and turn them backwards. On each tray, I put a subject label. 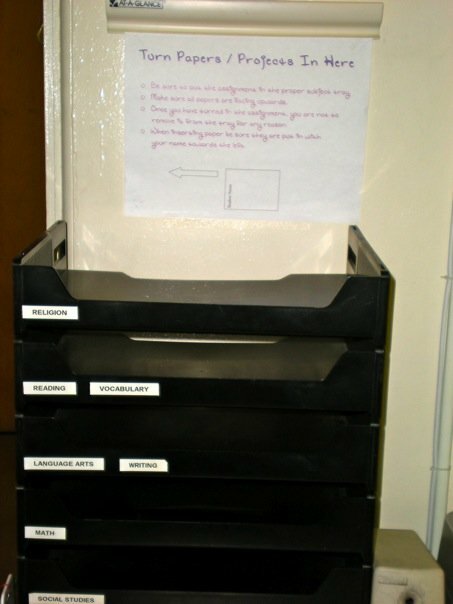 And right above it, I have a sign that tells students HOW to put their paper in the tray. This is key!!! 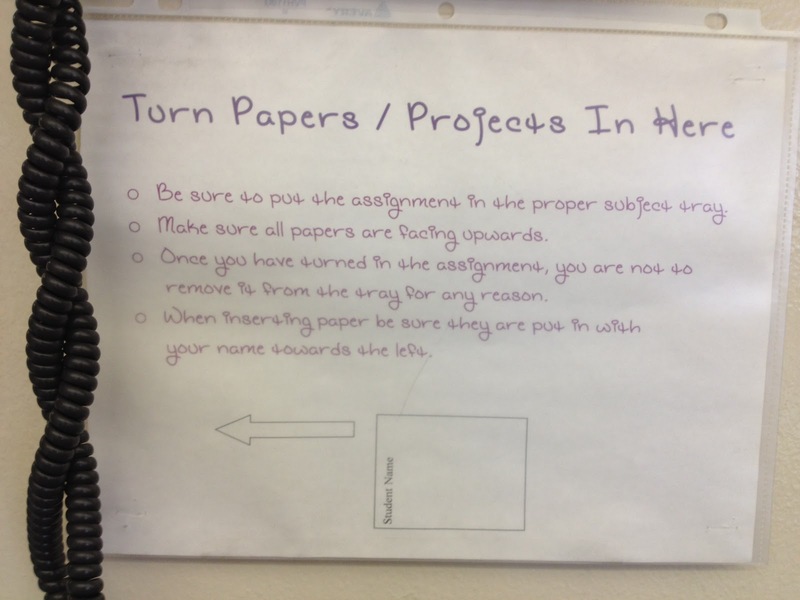 The sign has a a diagram showing the paper and the way it should go in along with some reminders such as is their name on the paper with the complete heading, etc. All papers go into the proper trays facing up with their name to the left. 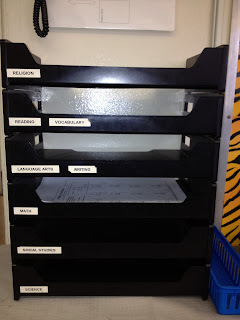 Students simply slide their paper in through the slot. (Another benefit to have the trays backwards is that they cannot easily take their papers out - I frown upon that once they have turned something in). Seriously - it's amazing. I spend the first couple of days of the school year drilling this into their head and we are set for the rest of the school year. No more messy stacks of unorganized papers - just neat piles with all your paperwork facing the same way. Do you have a system that works for you? Share it below! Who Wants to Be a Mathonaire?? I was super excited the other day when I received my weekly email from Edmodo with resources that have been shared on their site. They had this awesome Math game listed and after I checked it out, I knew other teachers would love it too. It's a take on Who Wants to be a Millionaire but is called Who Wants to Be a Mathonaire. They have five levels of difficulty - however, I think this would be best for grades 2-6. 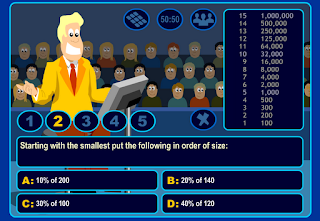 Just like in the original gameshow, you answer questions to earn points all the way up to 1,000,000,000. And you even get the three lifelines in case you get stuck. I suggest you check it out - I had a lot of fun playing around on it. The only wish downside in my opinion is that there was no sound. But I think my students would be hooting and hollering so much when we played that it wouldn't matter in the long run. How would you use this game in your classroom? Have you come across any great games? Share them below. P.S. If you don't know about Edmodo, read my post about it here. Top of the morning to all my Irish (everybody's Irish this time of the year....right?) blog friends. I hope you have been enjoying the hunt so far. 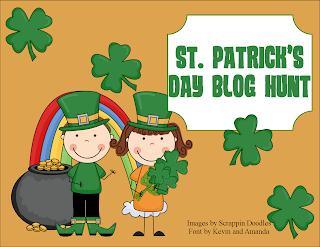 If you are just joining us today, be sure to check out the following blogs who have had goodies for you the past nine days. Day #9: Fabulous Fourth Grade Froggies and Globicate! I have a couple of freebies for everyone today! One is a math activity where students are multiplying decimal numbers for your students to do. The other one, takes me back to fourth grade when I was a child. On St. Patrick's Day, my teacher had 17 shamrocks hidden around the classroom. One was in the box of tissues, another in the pencil bin and so on. All were out of sight but placed somewhere that a student would stumble across it during the course of the day. 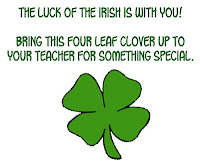 If a student found this shamrock, they received a special treat from the teacher. I remember it was so exciting to see who would find the next one. 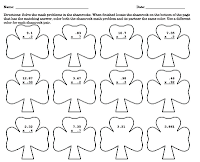 So in hopes to bring that same excitement to your class, I have created lucky shamrocks for you to hide around your own classroom. Simply click on the snapshots below to download these great freebies! Here's hoping the Luck of the Irish is with your kiddos! 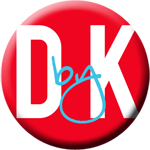 And I have even more good news for you - head on over to JD's Rockin' Readers who also has some goodies for you today! Hope you enjoy today's freebies and be sure to head on over to the next blog on day 11 of the hunt tomorrow. 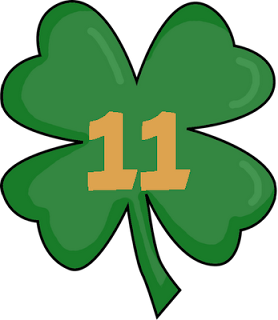 Just click on the #11 shamrock and it will take you away. And if you haven't already be sure to follow me here. You can also check me out on TpT, Pinterest and Twitter. Hello everyone - it's another WEBSITE WEDNESDAY!!! Today, I want to talk about my favorite place to get rubrics for almost every assignment you can think of. Personally, as a teacher, I am a big fan of rubrics. They really assist me when it comes to grading student projects and writing. Unlike tests and regular worksheets, I find that grading projects and writing is very difficult and hard to remain consistent from one student to the next. 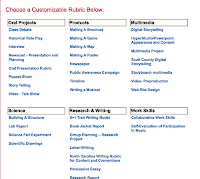 RubiStar is a website in which you can create your own rubrics for assignments or you can search their database of other teacher created rubrics. You have the ability to create an account and save any rubric you create and also add it to the database they have for others to search. Often, when I'm not quite sure what project I want to do, I go to RubiStar and do a generic search of keywords. 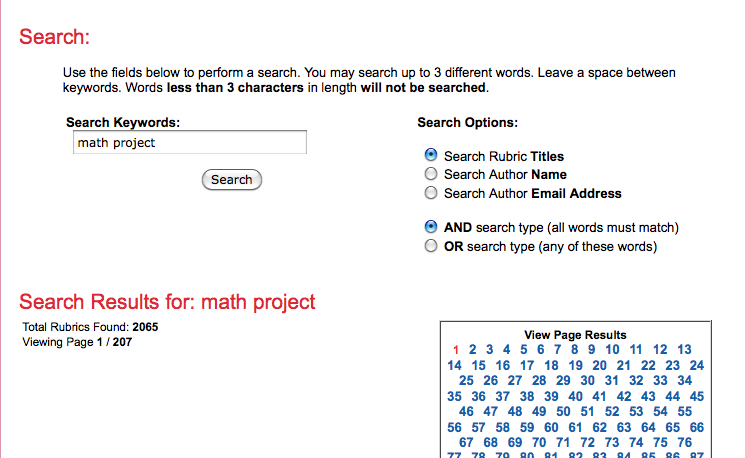 For example, if I want a math project idea, I go and search the words "math project" and I quickly scan the results. If I find a rubric that sounds like something I'm looking for, I grab it. 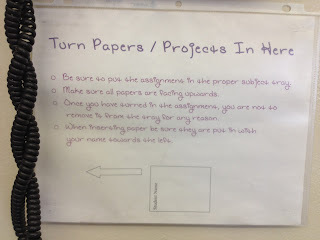 Then I work backwards with the rubric in hand and create the project for my students. Some of my best ideas have developed this way. However, sometimes you don't always find a great premade rubrics for what you need. When this happens, you can create a rubric. RubiStar makes this extremely easy! 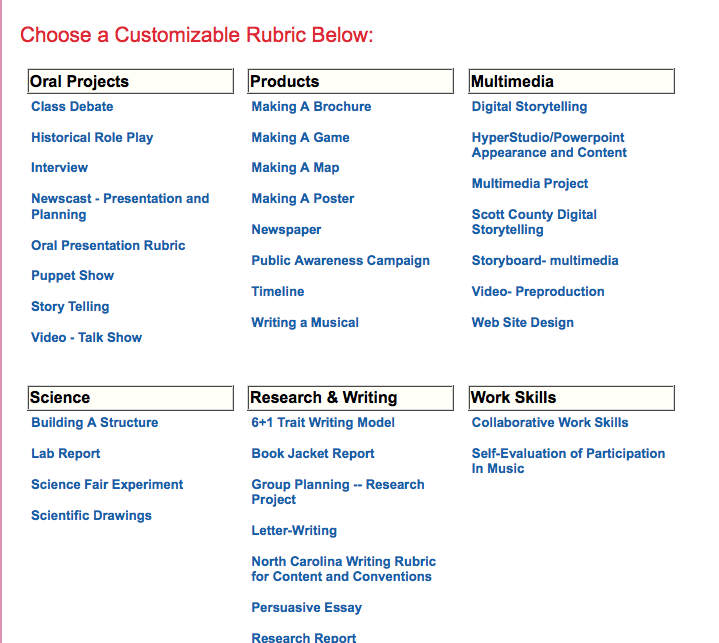 You choose from a list of customizable rubrics for whatever assignment you are creating one for. 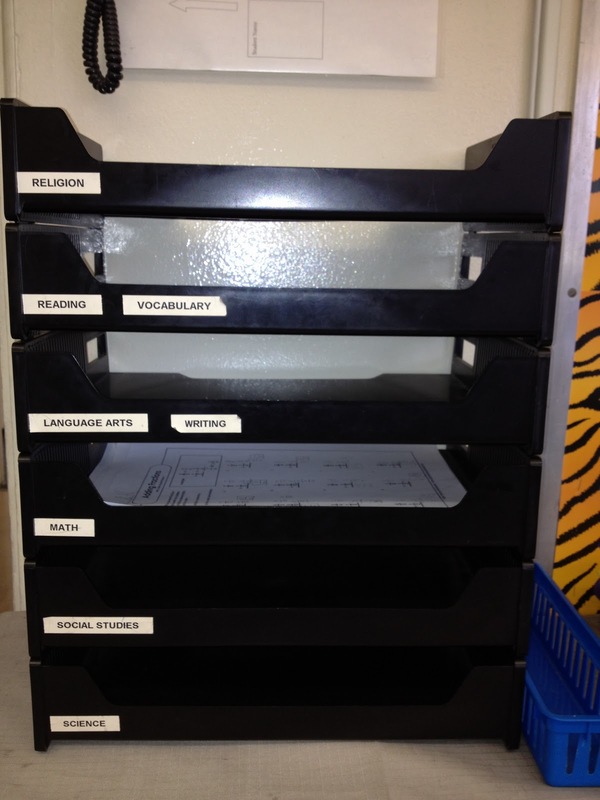 From there, they provide you a blank rubric that allows you to go in and create categories and number values. BUT the best part is, they also provide a drop down box with premade categories for you to choose from. And these are also editable. Once you have your perfect rubric created, you can print it or export it into Excel. 1. Guidelines - rubrics provide not only the teacher guidelines as to how and what they will be grading on but they also provide those guidelines to their students and parents. That way it is no secret as to what the teacher is looking for in the assignment. 2. 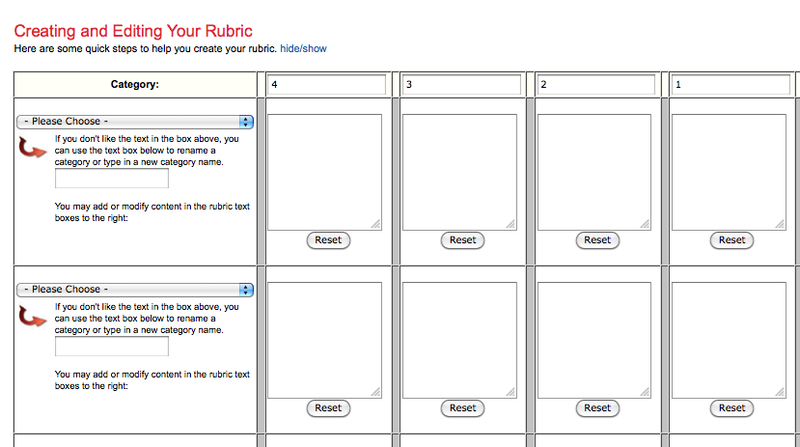 Self-assessment - I personally love to print out the rubrics and give them to my students when I give the assignment. When students turn in their final assignment, they also turn the rubric back into me which they self-assessed themselves on. This has been a huge step in getting students to actually look back over their work. Now trust me, I know there are MANY websites that you can get rubrics from but in my opinion none are quite as fabulous as RubiStar! And if you are completely clueless as to what to do, they even provide a tutorial for you. Check it out and tell me what you think.